To stalingrade something: to reduce to ruins with artillery and bombs. 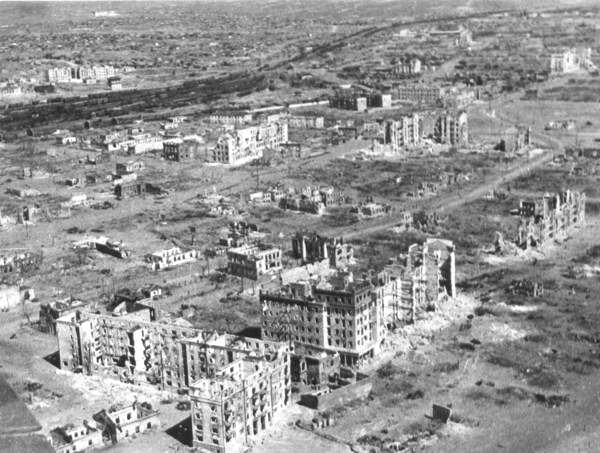 A portmanteau of Stalingrad (in its 1943 state) and to grade (meaning to reduce slope of a surface to a minimum). Modern day equivalent might be Homs, Syria. We could also Berlin or Tokyo them or in a bigger snit, we could Hiroshima them. Stalingrad would be total destruction, slowly. Berlin would be thorough destruction slowly, with Tokyo being the same, but using FIRE and saving the cultural treasures. Hiroshima would be the evaporation of a small part of the town with bonus toxicity around the evaporation zone, as a warning. I like it. Seems fitting for a place where one side of a room is building tanks while the other side is engaging in a firefight. I guess there was no Soviet word for “Worker’s Comp”?